AccuBar uses fast, durable barcode scanners, and/or smartphones and tablets, to quickly count inventory, receiving, transfers and empties. The scanners feed data to a hosted database that then produces key reports and metrics that you need to manage your bar business more effectively. AccuBar is the most full-featured beverage inventory management system available, with a track record of serving thousands of customers since 2001. Our modular design lets us configure the system for your needs, so prices can vary depending on your operation. Contact us to get a demo and pricing. can pull data from AccuBar (or function as a standalone system) to offer your customers an elegant, usable, interactive wine list that can increase your wine sales. One button publishes your current AccuBar wine info on tablets, your website, printed lists and even your customers’ smartphones. Appeal to the digital generation with a wine list that will make them repeat customers. Here’s a video that demonstrates a few of the things AccuBar Bar Inventory Software can do, along with how fast it is. 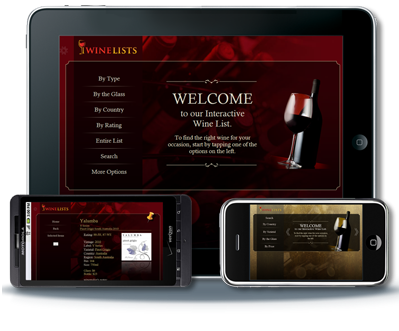 Check out our video for iWineLists, our fully integrated digital wine list for iPad, tablet, smartphone and print. Reports quickly calculate pouring cost percentages, variances, consumption, overstocking and other essential metrics so you can discover your losses and hold your employees accountable. Our barcode scanners will deliver major labor savings by speeding up the counting process for inventory, receiving, transfers and empties and delivering reports to your inbox within minutes. Whether you’re a small bar, a nationwide chain or a huge resort, we can configure AccuBar to fit your needs. We have modules that address cocktail recipes, large wine operations, internal requisitions, and more. Our new app allows you to scan items with an Android phone or tablet. The app can also connect your device to a Bluetooth scanner for faster scanning. 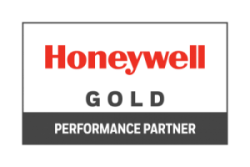 Monitor multiple stores and compare their performance as well as their progress in the inventory cycle. 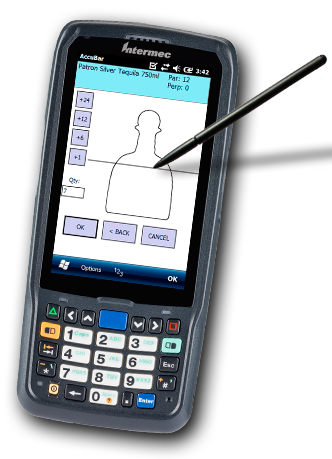 Our patented method allows users to tap a silhouette of the bottle on the scanner’s touch screen. The result is a simple, intuitive approach that is consistent and easily trainable. 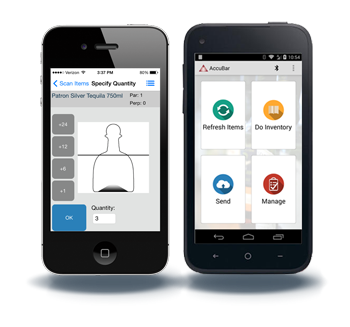 AccuBar can be used to inventory food, dry goods and other items. It will scan any item with a barcode, and will create a barcode for any item without one.